I love muffins and cupcakes of all kinds. Happy Herbivore has lots of recipes for them in her books and web site. But even the ones that are listed as "muffins" as opposed to "cupcakes" tend to have a lot of sugar. Her Apple Crisp Muffins, which she describes as her "My faaaaaaaavorite muffin recipe", contain raw sugar, brown sugar, and maple syrup in addition to apples and applesauce! Even before I went SOS-free, I thought this was too much sweetness. So the other night I tried substituting dates for all of the added sweeteners. I pitted six dates and blended them with the applesauce, which I made from fresh chopped apples with the skins on. I wasn't sure that would add enough volume to the recipe to make up for the 3/4 of dry and 1/4 cup of liquid sweetener, but not being skilled at original baking recipes I wasn't sure what else to add (or subtract). So I just put them in the oven and hoped for the best. They came out perfect in terms of sweetness, but a little dense in texture. That was fine, they were still very good. I had slightly better luck converting her Blueberry Oatmeal Muffin recipe, which contains a bit less sugar. Blueberries are naturally so sweet and flavorful that I got good results leaving out the sugar and maple syrup and using only two dates. Looking forward to converting more muffin and cupcake recipes to be SOS-free, and finding more that are already that way such as the great Carrot Cake muffin (or donut) recipe from Straight Up Food which I got boyziggy to make for me to celebrate my nameday. 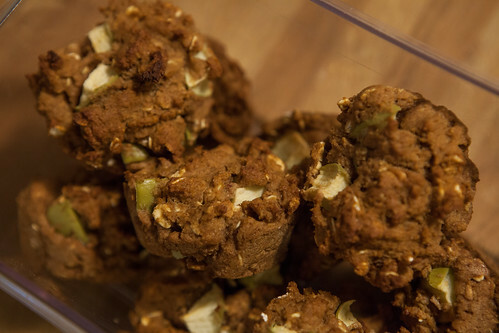 The Happy Herbivore Oatmeal Muffin recipe is also already sugar-free by default, so I'll be making that again for sure.